IA DESIGNS A WORKPLACE WITH MEANDERING PATHWAYS AND A VARIETY OF MEETING AREAS TO ENCOURAGE AND SUPPORT RELATIONSHIP BUILDING FOR LINKEDIN EMPLOYEES. LinkedIn, the preeminent social networking site for professionals, recently moved into the 28th floor of New York’s landmark Empire State Building. The new space caps off LinkedIn’s real estate stack of half a dozen floors that engineers, designers, and a robust sales team call home. The elevator lobby is bathed in blue light to signify arrival at LinkedIn’s “club level,” and—unlike signage—can be seen from any entry point. A ribbon of LinkedIn-blue millwork connects all amenity zones across the southern portion of the floor plate. Informal lounge spaces adjacent to amenity zones encourage collaboration. Customizable environmental graphics, including a chalkboard wall and marquis-tile board, promote staff engagement. The entrance to the speakeasy at LinkedIn New York’s 28th floor. Photo by Eric Laignel. 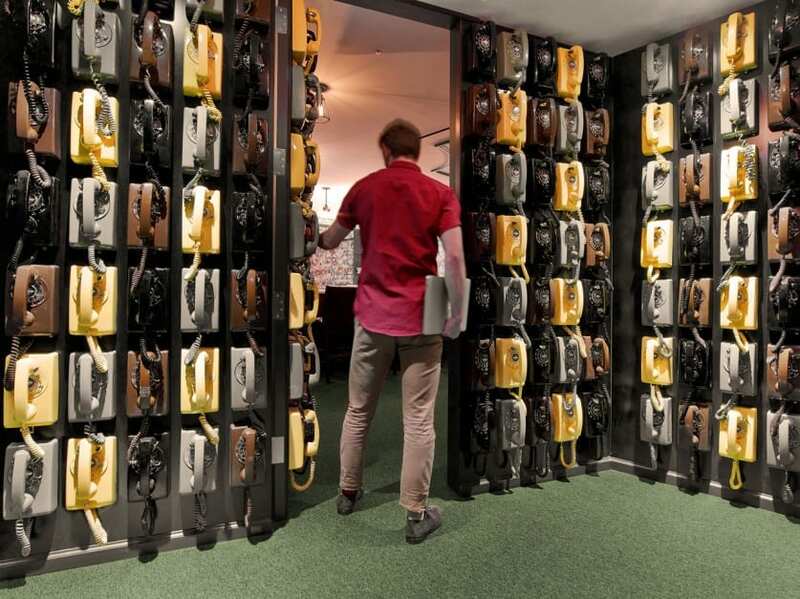 A speakeasy concealed behind 133 rotary phones reinforces LinkedIn’s commitment to connections through technology with a vintage twist. A lounge doubles as a gallery for photos of everyday architectural geometries throughout New York City that spells out LinkedIn NY. A photo gallery spells out “LinkedIn NY” at LinkedIn New York’s 28th floor. Photo by Eric Laignel. A meandering path guides ramblers around the floor plate and through workstations. Conference rooms are named after lesser-known, tertiary New York streets to spark conversation among employees. Conference rooms are named after tertiary streets at LinkedIn New York’s 28th floor. Photo by Eric Laignel. A custom light box in the conference center reinforces a sense of place for visitors. Views north to the Chrysler building and south to the Flatiron Building, OneWorld Trade Center Tower, and the Statue of Liberty remain unobstructed. Tour another one of IA's projects! Click below to see IA's design of Sonos' new workplace in Boston. So many hidden treasures in the design of LinkedIn New York!